In the sea of remakes, reboots, sequels that have been lathered heavily upon us in recent years, it is hard for one to remember many that have you leaving the theatre thinking it was a worthwhile endeavour. More often than not, despite the all too repetitive spin doled out by the studios, the ‘fresh approach’ given to these retellings is nothing more than new film stock and some contemporary performers—NOT fresh at all: pointless. The Planet of the Apes series was only recently rebooted, with Tim Burton’s unpopular version at the start of the century, so it came as no surprise there was very little interest in yet another proliferation of a well mined series when it was announced. We were told this would be taking elements from the 4th Apes movie, Conquest of the Planet of the Apes, without being a direct remake—and this reviewer yawned, suspecting the same old spin. I was wrong. In the recent tradition of Bond and Batman, this new instalment is a reboot; they’re starting from scratch with a film freed from the continuity of all previous films. They do make several nods to the pre-established mythology, but never pander to them, retaining their own tone and approach consistently throughout while tipping their hats. At its core, this is a cautionary tale, in the best traditions of such stories as Frankenstein, and while it takes some elements and a rather large premise from Conquest, it has definitely put its own imprint on the story of Caesar. In this contemporary world, a geneticist (James Franco) tries tirelessly to develop a serum to save his ailing father from Alzheimer’s disease. 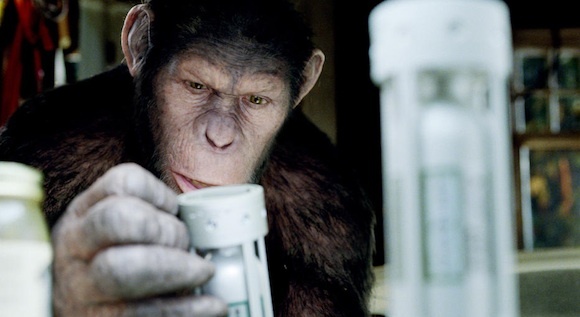 When his initial trials on chimpanzees go to hell rather publically, he takes his research, including a newborn chimp (Andy Serkis), home to start anew… and succeeds. Not only does he cure his father (John Lithgow), but his chimp Caesar displays extraordinary intelligence—a genetic by product from his mother. As Caesar grows, and the geneticist’s amended attempts on more chimps and his father progresses, the seeds are sprung for Apes to rise and mankind to fall. This is a delicately constructed narrative that builds to a rousing and satisfying conclusion. Franco is this story’s Frankenstein and Oppenheimer rolled into one; his plight and motivations are instantly sympathised with, and it is obvious what is going to happen toward the end—‘The road to hell is paved with good intentions’, comes to mind—but it is no less compelling for it. What really makes the movie is Caesar; a completely simulated (motion capture) ape, performed by Gollum himself: Andy Serkis. The nuances of this character, as he falls in love with his surrogate father, is cruelly torn away from him, and eventually leads his kind in a revolt, is nothing short of extraordinary. Such intricacy is achieved with this character with such impressive brevity that you completely forget it’s just pixels your eye can see. Serkis asserts that motion capture replicates an actor’s soul through a simulation, and without it, it would simply be a cartoon. I think he’s proven that beyond a shadow of a doubt twice now. None of the other apes register as anything less than real, either. It’s truly remarkable. Special mention must be made to British director, Rupert Wyatt, for the flawless handling of only his SECOND movie. You wouldn’t know the guy only has one much lower budget film to his name before this. I look forward to seeing his next effort. This is a new beginning for the Apes franchise, not one I am sure anyone wanted, but one—for once—that has earned the right to proliferate into sequels on its own merits, instead of the brand name. 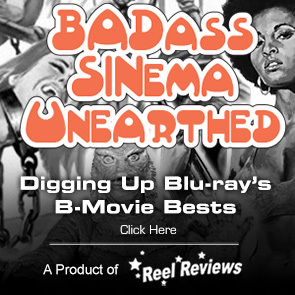 Not only is this one of the best tent pole films of 2011, it’s of the best genre films in years. Spectacular and unmissable, Rise of the Planet of the Apes is the best instalment since 1968. Well done. MPAA Rating: PG-13 for violence, terror, some sexuality and brief strong language. Memorable Movie Quote: "We're talking about huge potential for millions of people." Flawless AVC encoded transfer and 5.1 DTS-HD 5.1 soundtrack. Picture retains the subtle grain of the film stock, is rich is colour and depth, and shows no sign of banding, edge enhancement, or noise in the darks. Sound is aggressive and well dispersed through the speakers, creating an immersive environment for the living room viewer. Extras are a good mix of short featurettes, trailers and two commentaries from Wyatt and the writers. Not extensive for an auspicious restart to a long loved franchise, but not bad.